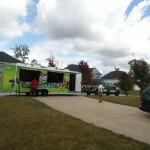 My neighborhood was SWAMPED with kids trying out the new Skylanders SWAP Force from Activision! 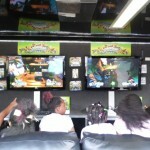 A 60 feet long game truck pulled up in front of my home and the day was set with 4 hours of gaming inside a plush truck with 4 large TV screens, comfy leather couch and lots of room for gamers to test out the new game. And they did just that –swapping out various characters on a new Portal of Power™ which let gamers transform 16 SWAP Force inter-action figures into more than 250 unique characters by swapping the top and bottom halves of the toys. I invited the neighborhood kids to test it out and at least 30 kids showed up and had an awesome time mixing and matching characters and playing the Skylanders game. Check out the video! This game truck came right to my doorstep! Cody and Shane from the Game truck guided the kids through the experience. The truck equipped as an arcade is in fact a great way to host a party for your kids. 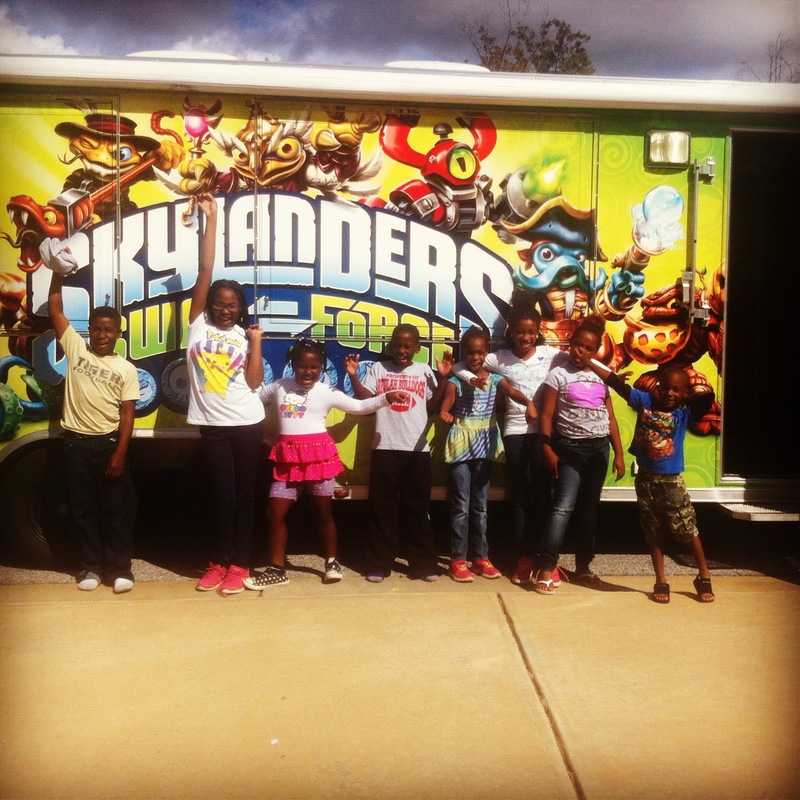 Skylanders is an incredible game that kept the neighborhood kids engaged for a full FOUR hours the truck was in my neighborhood! The whole time kids played on X-box and Wii game systems and even though this was a new experience for most, they quickly adapted to the game format and the dynamic swapability of the characters. The kids really enjoyed doing that. Skylanders SWAP Force also has an entire collection of 100+ characters from Skylanders Spyro’s Adventure and Skylanders Giants. 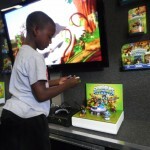 Skylanders is “mixing it up” with the newest game in the award-winning, top-selling franchise. Skylanders SWAP Force builds upon the success of the franchise’s signature gameplay and collectible toy experience, adding an all-new dimension to the “toys to life” innovation. The game introduces a compelling play pattern — dynamic swapability — Skylanders SWAP Force also features new abilities that can be used in previously unexplored areas of Skylands. The game also features 16 new core characters, eight new LightCore™ characters and 16 new versions of fan favorite Skylanders from previous games. The addition of the newest characters mean players will have more than 100 characters to choose from during game play. High-resolution graphics immerses players further into the game than ever before with detailed characters and richer environments in which to play and explore. 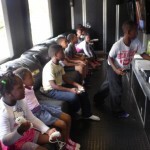 And if you’ve never been in the game truck, just know it’s an amazing experience that the kids did NOT want to end. It’s a party on wheels and it was very comfy inside. 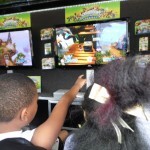 (www.gametruckparty.com) The interactive swapping action of the Skylanders game kept the kids engaged. The Skylanders game has eye-catching details, vibrant graphics and cool, crazy characters that the kids got to mix and match and make even more mysterious. Even kids as young as 5, like my son, middle-schoolers and teens were in the truck, swapping out characters and navigating their way through the action-packed game. I tried out the game and you literally can play for hours on end. 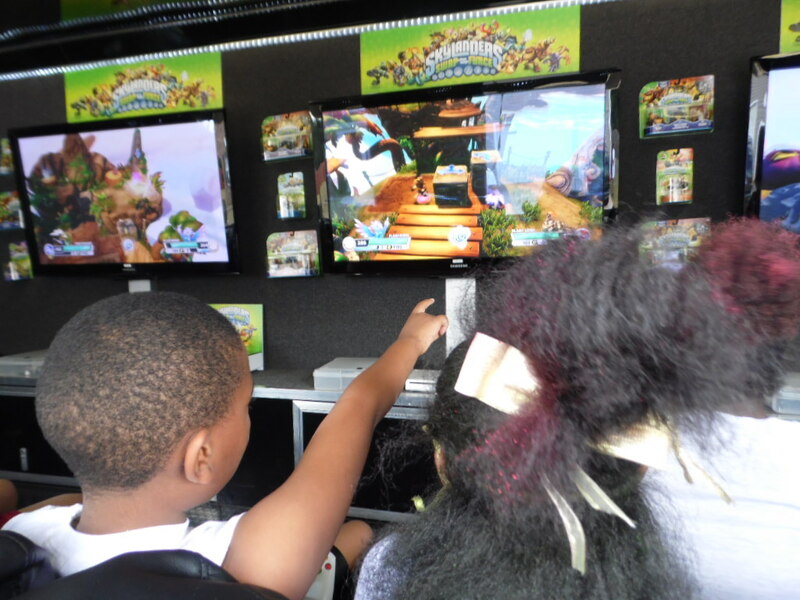 Disclosure: Thank you to Skylanders for providing the Game Truck (free-of-charge) to test out the new Skylanders Swap Force game with a party on my block! All opinions about this amazing experience are my own. This looks so cool, we are having our party in a few weeks and I’m super excited! Oh wow!! You will love it! I can’t wait to read about your experience!